RonDoids: The Enemy Amongst Us! OFA is 30,000+ strong and working to disrupt everything that our current president’s administration is trying to do This organization goes against our Democracy, and it is an operation that will destroy our way of governing. It goes against our Constitution, our laws, and the processes established over 200 years ago. If it is allowed to proceed then we will be living in chaos very much like third world countries are run. What good is it to have an established government if it is not going to be respected and allowed to follow our laws? OFA is dedicated to organizing communities for “progressive” change... Its issues are gun control, socialist healthcare, abortion, sexual equality, climate change, and of course, immigration reform. OFA members were propped up by the ex-president’s message from the shadows: “Organizing is the building block of everything great we have accomplished Organizers around the country are fighting for change in their communities and OFA is one of the groups on the front lines. Commit to this work in 2017 and beyond.” OFA’s website says it obtained its “digital” assets from the ex-president’s re-election effort and that he inspired the movement. In short, it is the shadow government organization aimed at resisting and tearing down the Constitutional Republic we know as AMERICA. Paul Sperry, writing for the New York Post, says, “The OFA will fight President Donald Trump at every turn of his presidency and the ex-president will command them from a bunker less than two miles from the White House.” Sperry writes that, “The ex-president is setting up a shadow government to sabotage the Trump administration through a network of non-profits led by OFA, which is growing its war chest (more than $40 million) and has some 250 offices nationwide. The OFA IRS filings, according to Sperry, indicate that the OFA has 32,525 (and growing) volunteers nationwide. The ex-president and his ‘wife’ will oversee the operation from their home /office in Washington DC. So, do your part.. You have read it, so at least pass this on so others will know what we are up against. We are losing our country and we are so compliant. We are becoming a “PERFECT TARGET” for our enemy! 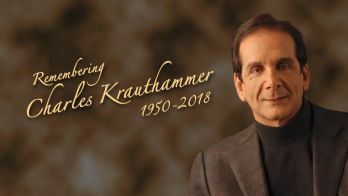 Editor’s comments: Krauthammer is about the best and brightest journalist and political analyst we had, in my opinion. His words of warning in the below message should be taken seriously and spread throughout the country so as many of our citizens as possible are made aware of what is happening right under our noses!